Online Reg Available until 04/24/2019 11:59 PM EST Register Online! Tournament In A Box, brings many modern capabilities to your event. Working with standard vga, hdmi, or s-video out, you can turn any television or monitor into a vibrant highly visible scoreboard for your spectators. 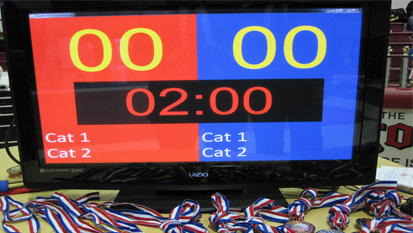 The scoreboard can run in stand alone mode or integrate with ring management and staging. 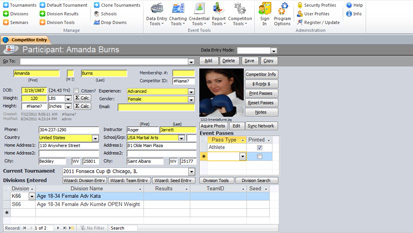 A wide selection of registration tools are at your disposal with Tournament In a Box. Intuitve graphical interfaces, online registration import, webcam, and network support are just a few of the features that allow you to register athletes, coaches, officials quickly and efficiently. Repechage, Single Elim, Double Elim, Scorecards and more! 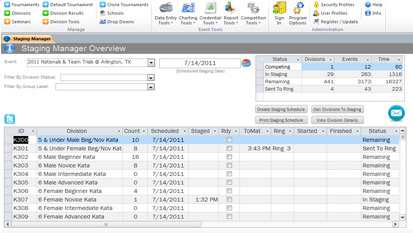 Print charts, split and combine divisions on the fly, seed athletes, and support unlimited size divisions! 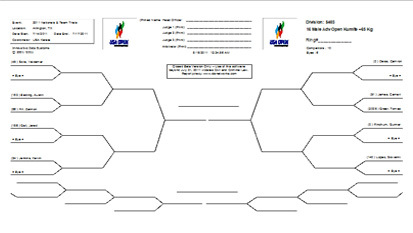 Tournament In A Box, provides a rich, unified platform to allow you to control all aspects of staging too. Print charts or push them directly to the rings. If you need support or want to inquire about purchasing a license for TDPro please contact us via email or our online contact us form for quickest turn around times.